Jack Mitchell is Chairman of the Mitchell Stores (Mitchells/Richards/Wilkes/Mario’s), a three-generation family business that operates men’s and women’s specialty stores in Connecticut, New York, California, Washington and Oregon that are nationally renowned for their personal service touches and strong relationships. 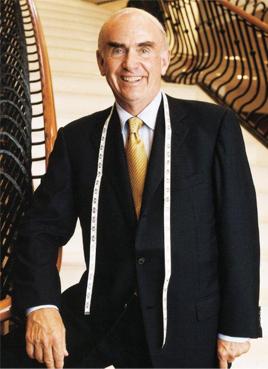 Jack himself has been recognized as one of the top ten retail visionaries of his time by the Women’s Wear Daily. After completing a B.A. at Wesleyan University in 1961 and an M.A. at the University of California-Berkeley in Chinese History, Jack joined the family business, Ed Mitchell, Inc., which was founded by his parents, Ed and Norma, and later became Mitchells of Westport. In 1995, Mitchells acquired Richards, the leading men’s clothing store in Greenwich, Connecticut, and in 2005, added Marshs of Huntington, Long Island, to the group. In December of 2009, they also proudly acquired Wilkes Bashford in San Francisco and Palo Alto, California and in October of 2015 they partnered with Marios in Seattle and Portland. In 2003, Jack Mitchell launched a “second career” as a speaker and author. His first book, Hug Your Customers: The Proven Way to Personalize Sales and Achieve Astounding Results, was a Wall Street Journal best seller and received rave reviews in the New York Times. In addition, it was endorsed by Warren Buffet on the cover with the following quote: “It’s a gem. I wish everyone at Berkshire would follow his advice – we would own the world.” In April, 2015, a revised and updated version of Hug Your Customers was released. In 2008, Jack published his second book, Hug Your People: The Proven Way to Hire, Inspire, and Recognize Your Employees to Achieve Remarkable Results where he illustrates a business blueprint to personalize relationships to drive success and achieve greater satisfaction at work. Jack has become known as a passionate enthusiastic public speaker, keynoting at over 200 events for corporations including Merrill Lynch, Pitney Bowes, Morgan Stanley, Conde Nast, Nike, Starbucks, Wells Fargo, Luxottica and Harvard University addressing audiences of all sizes and reaching over 50,000 people globally with Hug Your Customers/Hug Your People presentations. Jack has appeared on The NBC Today Show, and Kudlow & Cramer TV show as well as numerous radio interviews and online and print articles. Jack has been quoted in national magazines as a customer service and management leadership expert. In April 2005, INC Magazine listed Jack as one of the 26 Entrepreneurs We Love. Jack also offers hugging workshops for corporations. Jack shares with his family a number of Community leadership Awards from the Anti-Defamation league, The Menswear Division of UJA-Federation of New York, and Sacred Heart University. Jack is on the Yale Cancer Board, a Trustee at the Greenwich Hospital, and is an Executive in Residence at the Columbia University School of Business.